The reviews are horrible. The box office is horrible. 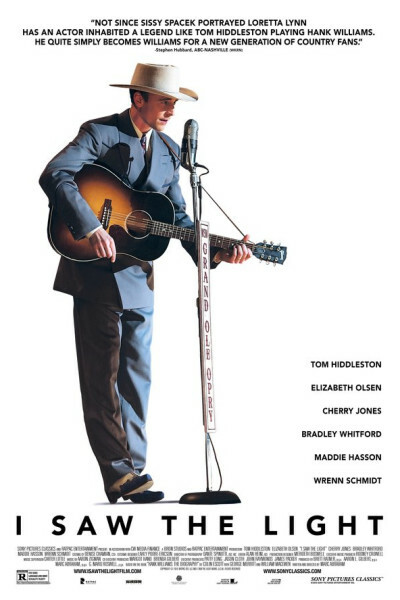 It has a number of fatal design flaws—many of which have to do with pacing, duration, recreated 'biopic within a biopic' footage (lazy and cheesy), and the overriding sin of missing the entire point: Hank Williams' songwriting genius. But somehow, regardless, I found a pony in the pile. Yes, there is some overacting on Hiddleston's part, and the script requires he spend much of his time in cold sweats, and swimming in liquor, and rolling in bed sheets, but he quite nearly single-handedly sews a silk purse from a sow's ear, and that's rather admirable and remarkable. I think he's a fine actor—better every time at bat—and those who deride a British thespian for tackling a Southern staple would do well to remember it's called acting for a reason. And wow, what Hank achieved in the six tumultuously tormented years between ages 23 and 29: 36 Top Ten hits, three #1's, 11 million records sold, and an influence upon...virtually everything subsequent, from entire stylistic genres (honky-tonk, rockabilly, troubadour, modern bluegrass, blues, folk, Americana, etc.) to tributaries that begat everyone from Dylan and Springsteen to contemporary singer-songwriters like Isbell, Stapleton, and Simpson. Not too shabby for a man crippled by pain, woesome personal demons, and the external manifestations thereof through three all-consuming addictions (whiskey, women, and work). The film rightly does not glorify these—nor 'heroicize' them—but, rather, like Williams himself, wallows in them to excess. The epitome of irony, I Saw the Light falls short in the writing department, failing to present a soberingly balanced and nuanced narrative of a complicated writer who overcame—until he was overcome by his own failings.